We Hidden New Jersey venturers always do our best to stay on the right side of the law and avoid unnecessary interaction with the authorities. Why, then, did I find myself in the presence of all things State Police? Fear not: I did it deliberately, and legally. The New Jersey State Police Museum is nestled just off Route 29 in West Trenton, actually slightly south of Trenton, to be more accurate. Long ago I heard that the museum held the electric chair used to execute convicted Lindbergh Baby kidnapper Bruno Hauptmann as well as other notable law-enforcement memorabilia, so I figured it was worth a visit. The first thing you encounter when you get there is the guard post on the driveway. You're approaching the State Police headquarters, so they want a careful inventory of visitors. I had to show identification to the guard trooper and tell him where I was going. I'd never been in the position to hand over my drivers license to a trooper, but I guess if you have to, this is the most benign reason. tattooing is a way to prevent poultry poaching. As you're walking toward the museum, you're greeted by a large golden statue of a state trooper in full uniform, accompanied by a sign asking you not to climb up and pose with it. Okay. One more checkpoint at the front door, and you're in. 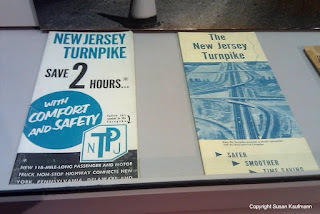 view into mid-century New Jersey challenges. Exhibits at the museum trace the history of the State Police from their origins in the early 20th century up to recent years. While most of us think of troopers mostly as a Parkway and Turnpike phenomenon, much of the early activity centered on keeping order in communities lacking their own local police forces. 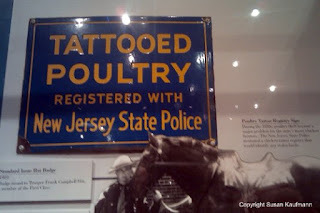 The same organization that works to prevent terrorism today used to guard against chicken thefts in rural New Jersey. Similarly, while troopers of the past thirty or forty years have made countless drug busts on the Turnpike, their counterparts in the 20s were focused on stopping bootleggers and moonshiners. Law enforcement enthusiasts will get a lot out of the museum, given its exhaustive review of details including police vehicles, badges, uniforms, weapons and the like. 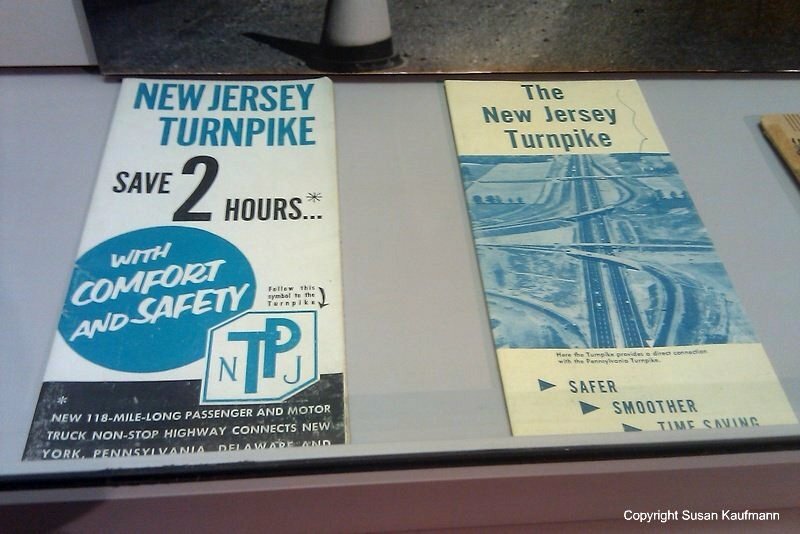 For someone like me who's not as much into the accouterments, well, I was a bit more interested in the old Turnpike brochures, the mocked-up forensics lab and a really cool bulletproof vest designed especially for police dogs. Oh, and the electric chair? A two-dimensional, full-sized photo was there in its place, since the real thing had been loaned out to another museum. However, the Baby Lindbergh kidnap story has a rightfully-sizable spot near the front of the museum. It was this investigation that put the State Police on the map and made them world-famous in the early 1930s. Authentic evidence including some of the ransom notes and a portion of the ladder the kidnapper used are on display, along with newspaper articles and other memorabilia. Another Roebling on the Delaware. Whoda thunk? Cheap gas... mall shopping... and a duel?